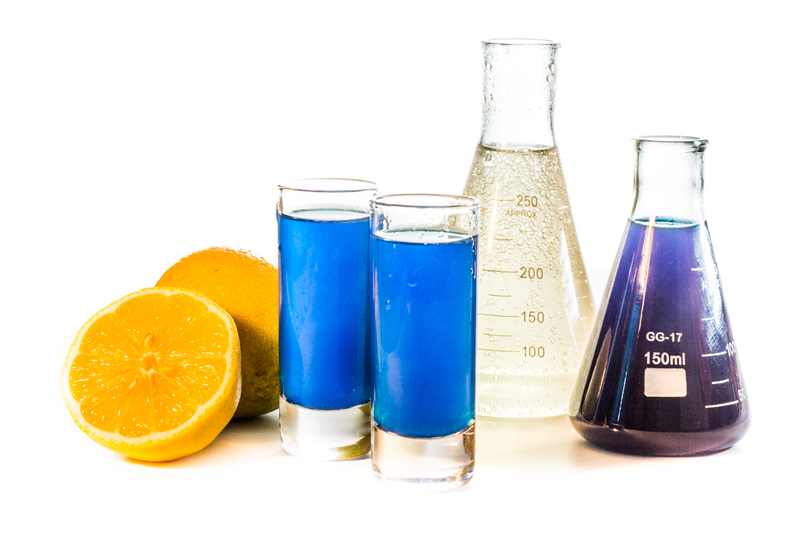 Tidy Bowl Shooter – like something out of a lab. Good science, wonderful science! I had the fun and honour of offering non-alcoholic shooters at a teen dance for Winter Carnival and wanted to come up with something a bit “odd” to offer on the list. 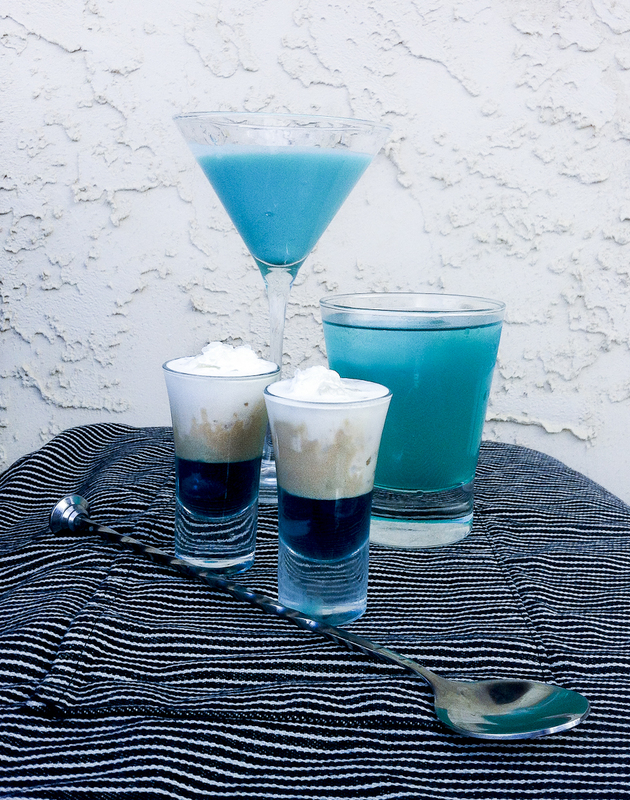 As I was using my DYI curaçao syrup for another shooter (Blue on Ice) that I had created back in October of last year, I thought I would see what other things could be done with this ingredient. I came across a recipe for a shooter called Tidy Bowl on the Ultimate Shooter List on Good Time Charleys menu. And looked to see who else had come up with the idea of replicating the toilet bowl cleaner colour and look in a shooter. Turns out that the tidy bowl recipe is not the same across the internet – other than that they all use curaçao for the colour blue. BarNoneDrinks suggests rum and grapefruit juice mixed with the blue curaçao, BartendingBlueprint suggests a combo of southern comfort, sweet and sour mix and curaçao, BarGeek and TheBartend.com suggests simply curaçao and vodka (although BarGeek suggests a few raisins in the bottom – which means the bowl isn’t tidy doesn’t it?) mmm. So for a non alcoholic version, it seems that it’s wide open to be inventive, as long as I use curaçao in the mix! Well the stores now offer a martini mix called blue raspberry. I thought, hey it’s blue too, why not mix that into the recipe! The flavours paired well but left the drink needing something to cut the sweetness. Ah Jamaican ginger beer man, that’s the thing! And boy does it pack a kick! But how to take it one step further… what about that lemon fresh scent that you often get after cleaning a bathroom? … sure why not! So I mixed the drink, and then rubbed the rim with a half lemon, letting the juice run where it may – yup lemon freshness. And the flavour worked – better than I could have hoped for. Measure out ingredients into shot glass finishing with the ginger beer. Rub lemon half on the rim allowing some juices to drip into glass. Serve. 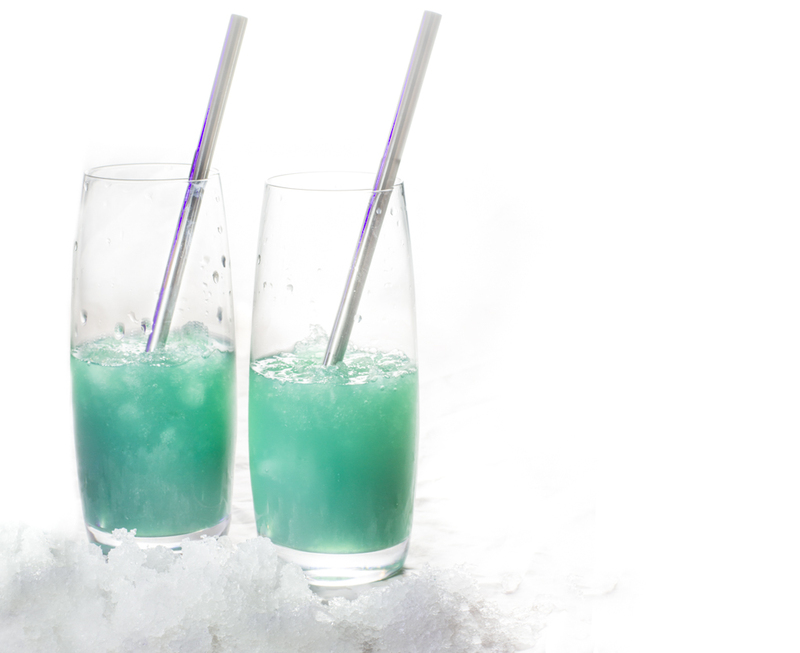 I was excited to offer this at the dance, it is a simple drink to make, looks fun and has a strong flavour. As it turns out my instincts were dead on, and this became the most popular choice at the event. Teens kept coming back for more, asking for “that blue one” (maybe I should rename it… nah!). Of the 38 drinks sold that night to a small group of teens who attended the event, I make about 25 Tidy Bowl shooters and used half a bottle of home made Curacao syrup! The night was a huge success for Experimental Virgins. I am guessing each youth had about 3 drinks on average – not including the free shooter game I offered – yup, I did a shooter game with my Dragon’s Breath recipe, served in test tubes and made as spicy as a set of dice dictated. While some recipes were not as popular ( due to personal tastes) and I had a dickens of a time getting my ice to crush satisfactorily for the Blue on Ice recipe (shooting back chunks of ice isn’t pleasant! ), I am looking forward to offering virgin shooters at future wake-a-thons, dances and other youth events. TEEN-o-metre 5/5 absolutely enjoyed by all who tried, they came back for more! Taste: 5/5 Strong, spicy and seconds are required. Simplicity: 4/5 once the curaçao is made, it’s a cinch. Ingredient finding: 4/5 if you can’t find mandarine for the curaçao, just use more orange extract, if you can’t find either… meh!